A new classification system to stage cervical adenocarcinoma could mean more accurate prognoses and less invasive surgeries. The American Cancer Society estimates that nearly 13,000 patients will be diagnosed with cervical cancer in 2016. Cervical adenocarcinoma accounts for about 25% of those cases. 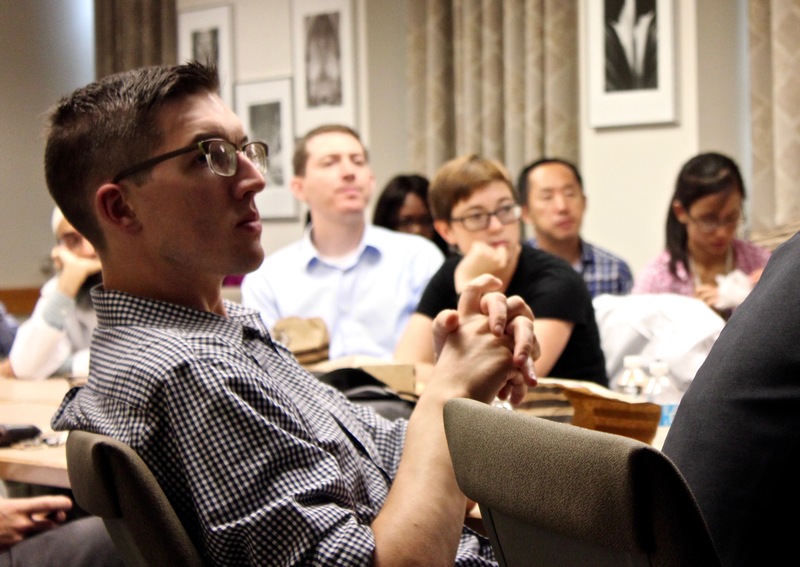 University of California – San Diego’s Andres Roma, MD, shared his latest research and proposed staging system in front of a packed room Sept. 22 at the University of Chicago Department of Pathology’s Pathobiology of Disease Seminar. 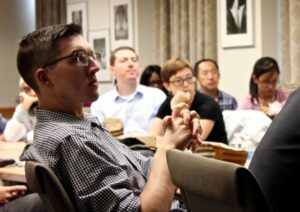 University of Chicago doctors, professors, researchers and students from a variety of fields attend Dr Roma’s talk at the Department of Pathology’s Pathobiology of Disease Seminar on Sept. 22. Photo by: Kathleen Ferraro/UChicago ITM. “It’s not the depth of a tumor that shows you if the patient has a chance, it’s the pattern,” said Roma, UCSD’s director of gynecologic pathology. The current classification system focuses on the depth of the patients’ tumors, or “depth of invasion,” to classify the stage of cancer. In the earliest stage, Stage I, the cancer is confined to the cervix. In Stage IV, the most advanced level, the cancer has spread beyond the pelvis. But Roma said this staging has its shortcomings. Because of the emphasis on depth, patterns within the tumor may be overlooked – patterns that could better predict the patient’s survival odds. Roma said that cervical adenocarcinoma should be staged according to those tumor patterns. His proposed system organizes cervical adenocarcinoma into patterns A, B or C, with the most advanced-stage tumors almost always categorized as pattern C. By observing patterns of cells, glands and connective tissues, pathologists can identify “risky” invasive glands that may have been overlooked in tumors that are shallow, or they may notice a lack of those in much larger tumors. And these categorizations in turn affect a patient’s treatment. Pattern A might only necessitate a cone procedure, to remove cancer cells in the cervical tissue. Invasive surgery, such as a hysterectomy to remove the uterus and cervix, would only become an option in the more advanced patterns B and C. And that kind of major surgery comes with a host of potential complications, like the inability to bear children and urinary bladder and sexual dysfunction. Dr Roma highlights the details in a tumor that distinguish between pattern categories. Photo by: Kathleen Ferraro/UChicago ITM. With more accurate staging, Roma said patients could be treated with more conservative therapies and avoid unnecessary procedures. A study recently published in the journal Modern Pathology showed that this pattern system better predicts prognosis compared to the current depth of invasion system. And three out of four reviewers of interobserver studies agreed on 85 percent of the classifications, demonstrating that the pattern system has reproducible data. 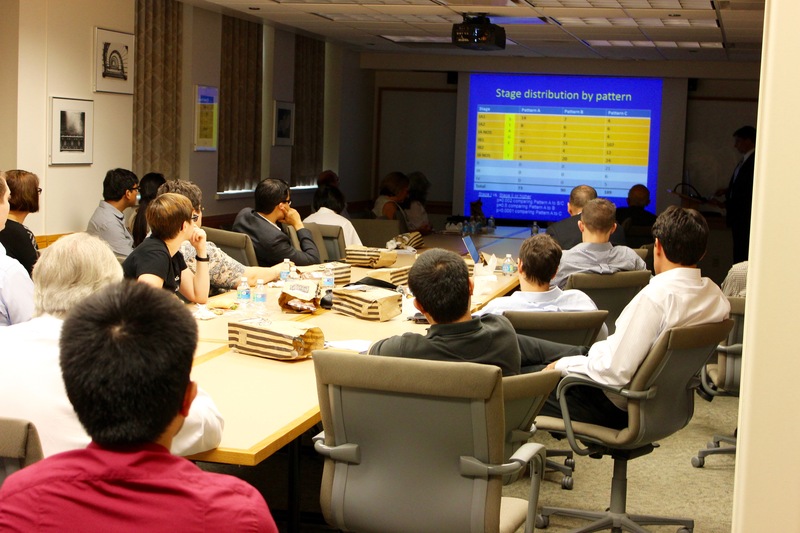 Pathobiology of Disease Seminars are held every Thursday throughout the academic year. Photo by: Kathleen Ferraro/UChicago ITM. From the potential to avoid a major operation to the peace of mind that comes with a more accurate prognosis, the pattern system has the potential to help patients in many ways, Roma said. He plans to work with other oncologists to explore the possibility of modifying the current staging system and treatment standards. 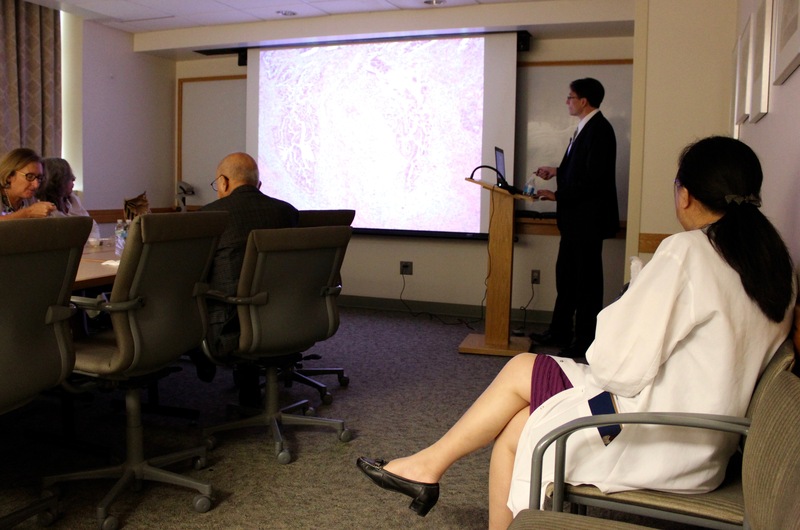 Members of the seminar audience, who ranged from distinguished pathologists to students, said they found Roma’s research intriguing. 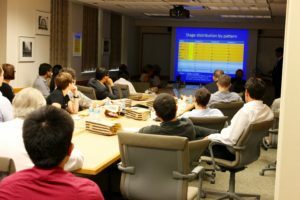 The weekly Department of Pathology Pathobiology of Disease Seminars are supported by the Institute for Translational Medicine (ITM) and the Committee on Molecular Medicine (CMM), and they draw local and international experts to present on campus every Thursday throughout the academic year. Want to collaborate on research or find out more information about Dr Andres Roma’s work? Connect with him at arpato2012@gmail.com.